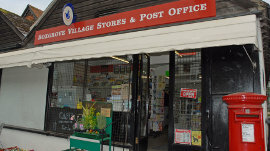 "Boxgrove Village Stores is so much more than a newsagent. With a café, serving snacks and lunches, it's a place where the community meets, chats and shops. Our store stocks a wide range of local produce: from local honey, luxury jams, bread and vegetables to gifts and greeting cards." Boxgrove is famous for the discovery in 1993 of the Boxgrove Man, whose bones are thought to be half a million years old. Boxgrove Priory features some of the best renaissance carvings of any English church.